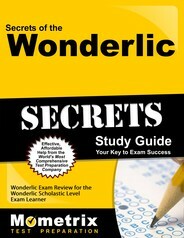 A variety of approaches can be helpful for your test, including a Wonderlic Test Study Guide. Another helpful resource are Wonderlic Test Flashcards for students who prefer to study in bite-sized pieces. Preparation is your responsibility. While Wonderlic may be best known as the test offered to those aspiring to play in the National Football League, Wonderlic offers products used by many different types of employers in virtually every type of industry. One of the most popular tests offered by Wonderlic is the Contemporary Cognitive Ability Test (formerly the Wonderlic Personnel Test – Revised, or WPT – R). This test is used by employers during their hiring process. Wonderlic reports that it can improve employee productivity and reduce turnover by predicting which employees would have the most success in a position. It helps measure general mental ability as well as a candidate’s ability to understand instructions, adapt, and problem solve. A total of 50 questions are asked. Taking numerous Wonderlic practice tests is recommended for test day success. What does a Wonderlic test measure? The Wonderlic test measures learning and problem-solving skills of prospective employees. What kind of test is the Wonderlic? The Wonderlic is a group intelligence test used by employers to assess the aptitude of potential employees. What is the Wonderlic test questions? The Wonderlic test is made up of 50 multiple-choice questions that must be answered in a set amount of time. Are you allowed to use a calculator on the Wonderlic? Calculators are not allowed on the Wonderlic exam. The test is designed to be taken without one and requires that the taker study aptly beforehand. What is a good score on the Wonderlic? For each answer you get correct on the test, you get one point added to your score. The average score for the test is 20, but a good score will depend on the profession of the taker. What is on the Wonderlic basic skills test? The Wonderlic Basic Skills Test will test you on basic verbal and quantitative skills with a time limit of 20 minutes for each section. The Contemporary Cognitive Ability Test is offered online (though a paper option is also available) and results are available immediately after a prospective employee is done. Asking prospective employees to take the exam is not a significant burden as it only requires 12 minutes to complete. Reports include interpretations of a test taker’s result as well as an IQ equivalent. In addition to individual reports, the test also allows employers to quickly sort through all results and prioritize candidates based on customized scoring. The Classic Cognitive Ability Test, formerly known as the Wonderlic Personnel Test, is very similar to the Contemporary Cognitive Ability Test. It is also only 12 minutes long and asks 50 questions. It is offered online but a paper version is also available. The Classic Cognitive Ability Test is offered in more languages than the contemporary test, and a large print version is available as well as one on audio tape. Another popular exam offered by Wonderlic is the Wonderlic Cognitive Ability Pretest (formerly known as the Wonderlic Personnel Quicktest, or WPT-Q). The Pretest is shorter than the other Cognitive tests as only 30 questions are asked in the span of eight minutes. While the other cognitive tests are proctored, the pretest is non-proctored and is best used in conjunction with either the classic or contemporary cognitive ability tests in a proctored environment. The Cognitive Ability Pretest is convenient for the test takers as it can be offered from any computer with Internet access and taken at their own convenience. In addition to the cognitive tests, Wonderlic offers an even greater number of knowledge and skills tests. The Basic Skills Test is offered in both proctored and non-proctored formats. This exam measures both basic verbal and quantitative skills that are intended to assess whether prospective employees are currently ready to work in the selected position. This test is most useful for those in positions requiring mathematical calculations and communication skills. Wonderlic also offers a number of personality tests. Five- and seven-factor personality tests measure workplace personality traits including agreeableness, extraversion, conscientiousness, emotional stability, and openness. These tests are useful in that they can be used for both hiring purposes as well as for development of existing employees. They also have an “Entrepreneurial Profile” exam which helps employees identify the “out-of-the-box” thinkers within their organization. Traits identified in this test include risk tolerance, creativity, intuition, and a variety of others. Another popular type of exam offered by Wonderlic is the behavioral reliability tests. These tests are most useful in helping employers determine who are the most low-risk employees. Their suggested usage is for employers looking to hire employees with little prior work experience and who will have access to company assets such as vehicles, cash, or other valuable property. Explore our free Wonderlic review provided by Mometrix. Check out our premium Wonderlic study guide to take your studying to the next level. If you benefit from these materials, just click the link below! 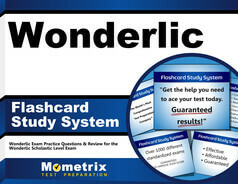 To compliment our Wonderlic book, we also offer extensive flashcards for even more Wonderlic test prep help. We hope you enjoy our products! Your purchase helps us make more great, free content for test-takers just like yourself.